Indeed, every week Greek television presents a forged movie of Papadiamantis' The Gypsy Girl, which depicts Greeks before the Fall of Constantinople in Peloponnesos as seemingly being enslaved in Romiosini. (13) In order for people to not become indignant by this, the Romans are called Byzantines. Therefore, Greek television teaches our children through this movie that Greeks were enslaved in Constantinople and that the Hagia Sophia of Justinian the Great was a church of the enemies of the Greeks. The funniest thing about this whole tragedy is that the Vlach-speakers of Roumenia today are also called Romans and have as a name for their state the true name of the "Byzantine" Empire. Nevertheless they also became enslaved to Constantinople and the Ecumenical Patriarchate. 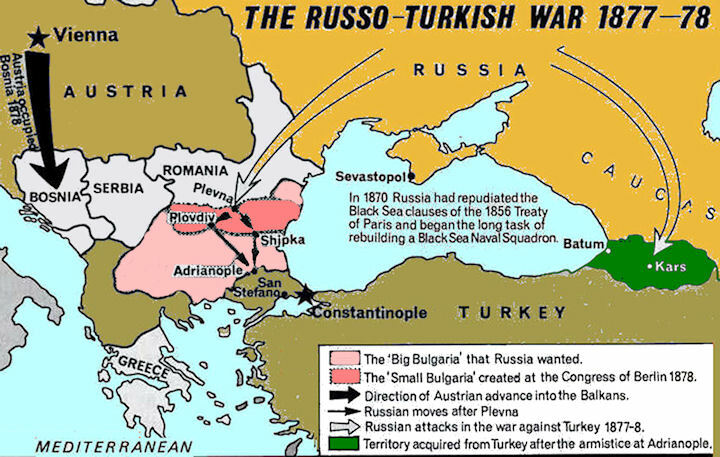 This Russian plan however was not only limited to the Balkans. After many centuries of Arabian and Turkish occupation many Romans completely forgot the Greek and Latin language and spoke Arabic and Turkish. The Russian propaganda established around 70 schools that taught the Arabic language in the Middle East and they tried to convert especially the Arabic-speaking Romans into Arabs and turn them against the Greek-speaking Romans. In this way they hoped to turn the Patriarchates of Antioch and Jerusalem against the Ecumenical Patriarchate and bind them tightly with Russia. In the war of 1878 the Russians crushed the Turks and again arrived up to Constantinople, as they did 50 years earlier, in 1828. This time however they were ready to divide the Balkans, not how Rigas Velestinlis and John Kapodistrias wanted, but instead how the dominant spirit of Pan-Slavism wanted. For this they imposed the Treaty of San Stefano for the independence of Roumania, Serbia, Montenegro and especially the establishment of big Bulgaria that reached all the way to Thessaly, which was limited by extension in the Treaty of Berlin that same year. This preceded the self-establishment of the Bulgarian Church and its self-detachment from the Ecumenical Patriarchate, in accordance with the example of the Church of Greece. In order to eradicate the liberated new Bulgarian national consciousness from that of Romiosini, the Russians took care for all the officers of the new Bulgarian army who were captains and above to be Russians and not Bulgarians,(14) who still had the "bad" habit of calling themselves Romans. 13. We are not at all to understand the possibility that Gemistos Plethon did not consider himself a Roman. When he says that we are to become Greeks again, he clearly means that according to him we must become idolaters, namely Roman idolaters. Besides this Plethon was a committed Constantinoplitan Roman. Furthermore, the simple thought that Greeks would be made to appear as enslaved in Constantinople would have brought Papadiamantis to indignation. 14. M.S, Anderson, The Eastern Question, p. 228.